Homeownership for this age group dropped from 50% in 1980 to 25% in 2013. More dramatically, after homeownership for median-income married couples age 25-34 stayed close to 80% from 1980 to 2007, it fell to only 50% in 2013. Expensive real estate, which is especially unaffordable for young people just starting careers. 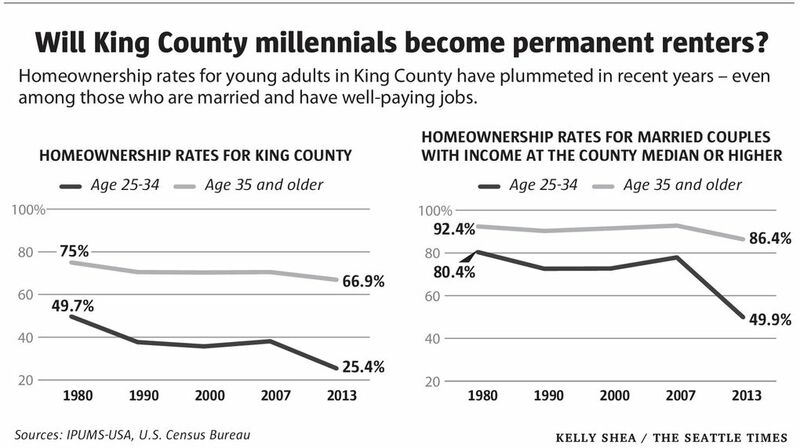 Delay of marriage (which is often paired with buying a home): 53% of King County’s 25- to 34-year olds have never been married compared to 27% in 1980. College debt – a 5-fold increase nationally – which can severely limit the ability to save for a down payment and qualify for a mortgage. Shifting attitudes towards homeownership, due in part to post-recession wariness, plus an appreciation of the flexibility and freedom from responsibility enjoyed by renters. Additional housing updates will be posted in the coming weeks.